Pixels are the very basic unit in computer imagery. It is present in every aspect of computing where an image is displayed, pictures are measured in pixels, the screen is also measured in pixels. The problem with pixels is that it does not exist in the physical world and there is no direct correlation to any physical quantity. DPI stands for dots per inch, and this provides a correlation between the computer and physical world often trading quality for size or vice versa. Raising the number of pixels in the image while keeping the DPI the same would result in a much bigger image. When you reverse it, increasing the DPI count while keeping the resolution the same, would shrink the image. The concept of pixel count and DPI are very apparent in two common devices, screens and cameras. It has been common knowledge that in order to have a high quality image, you would need to have a very high resolution or a great number of pixels in the image in order to capture the maximum amount of data. High resolution images don’t have much of a difference when printed in a small piece of media, but it allows you to scale the image to a much bigger media without noticeable degradation. With screens, the difference can be seen with SD and HD TV sets. With TV sets of the same size, HD sets offer a better looking and more vibrant image than SD. This is because HD sets have more pixels in them and therefore, a higher dot per inch count. SD screens are forced to enlarge each pixel in order to fit it in the large screen. The bigger pixel size can then be easily distinguishable. The resulting picture from the SD would then be blocky and very unappealing. Pixels cannot be easily added to images without deteriorating the final output; this makes it a priority to maximize the resolution of images when taking pictures. DPI can be easily changed in order to fit the desired size later on. This makes it less of a priority as long as the resolution is high enough. Ben Joan. 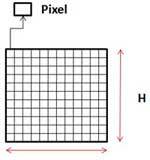 "Difference Between DPI and Pixels." DifferenceBetween.net. September 21, 2009 < http://www.differencebetween.net/technology/difference-between-dpi-and-pixels/ >.